The SwagTron T6 is the world’s first hoverboard that supports over 400 lbs of weight. Another off-road hoverboard the EpikGo supports only 240 lbs, the Jetson V8 off-road hoverboard supports up to 231 lbs and the Halo Rover off-roader hoverboard supports 256 lbs. 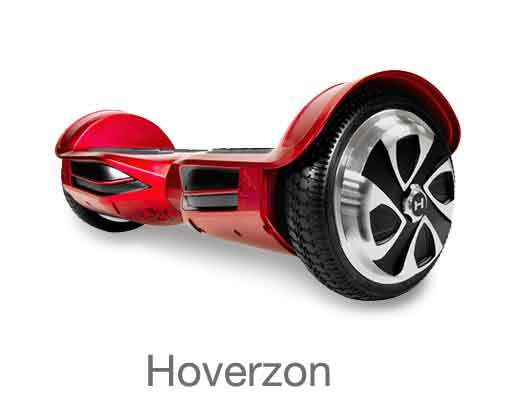 This makes the SwagTron T6 the world’s only hoverboard that supports over 400 lbs. 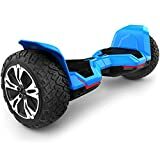 It is a true blue off-roader hoverboard that can take you where other hoverboards cannot go. 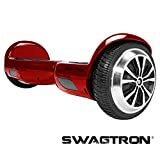 If you are looking for a non off road hoverboard then be sure to check out the SwagTron T3 and the SwagTron T1. It is the world’s only hoverboard that can support weights over 400 lbs. That means everyone of any weight and size can ride it. It is UL 2272 certified that is the ultimate safety certification approved by the US Govt. It has passed hundreds of quality and safety tests to earn this UL 2272 certification. 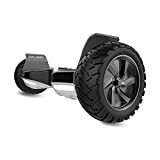 It is an all-terrain off-roader hoverboard which will take you through bumpy ground, grass, gravel, uneven surfaces and almost anywhere that you may wat to go. It is water resistant so it can take you through rain too. It will take you up inclines of up to 30° which is more than enough for normal circumstances. It has an impressive range of 12 miles on one full charge and can go to speeds of up to 12 miles per hour. That is a real off road experience waiting for you. To take you where other hoverboards cannot go, it has 10 inch tubeless tires that a rugged and specially grooved for all terrain hoverboarding. The 10” rubber tires have a tread pattern that is rugged and it has staggered shoulder blocks that deliver superior traction and grip. 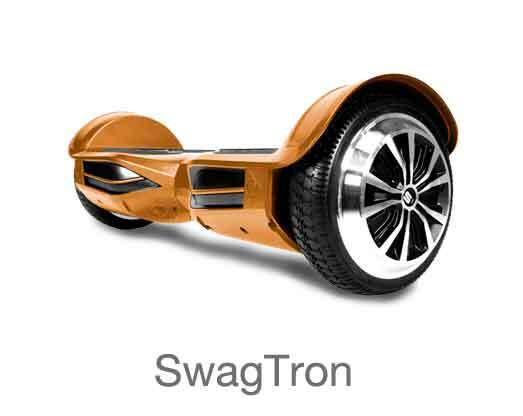 And to add to all that the SwagTron T6 has Bluetooth speakers that will play your music while you cruise along. Play your music directly from your phone as you master all terrains on your SwagTron off road T6 hoverboard. A poly carbonate body that is incombustible fire retardant and scratch resistant. Beautiful matte finish in an array of exciting colors. Wheels that are made from milled official aluminum and rubber tires that are 10” and specially treaded for rugged terrain and better traction. World’s first hoverboard that can support 420 lbs (191kg) and yet works effectively with a minimum weight of 44lbs (20kg). Has a built-in carry strap that makes it easy to carry around, without any additional bag. A maximum speed of 12 miles per hour or 19.2 kms per hour, with a range of 12 miles. UL 2272 certification for the ultimate safety of the hoverboard and all electrical parts. 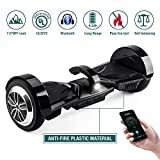 A comprehensive iOS and Android App that connects and controls your SwagTron T7 hoverboard. 5 level battery indicators so that you always know just how much charge is left, and LED motion indicators and headlamps for extra riding style and safety. 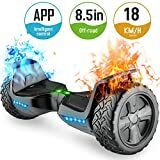 ALL-TERRAIN RIDES - 7.5 inch solid tires and top 350 w Dual motor gives this OFF ROAD Hoverboard power to maintain a 20-kilometer range, easily climb slopes and maneuver close spaces. Made from strong aircraft-grade aluminum alloy frame that allows it to handle up to 220 lbs of load. 2018 NEWEST APP ENABLED - KOOWHEEL PLUS APP with different mode to choose from - Beginner, Intermediate and Advance. Features where you can monitor your speed, GPS tracking of your self balancing scooter and set age restriction. The app let's you change the max speed, sensitivity, and driving force. Suits for both Andriod & ios. SAFE - UL 2272 Certified KOOWHEEL board with UL2271 Certified Samsung Smart Battery. Underwent and passed 159 tests regarding safety regulations, meaning no potential fire hazards. UNIQUE DESIGN - With a display screen and one grip on board, KOOWHEEL K5 SELF BALANCING HOVERBOARD IS A SPECIAL ONE IN THE MARKET. HD screen in handle to show information such as MOTOR TEMPERATURE, REAL-TIME SPEED, BLUETOOTH CONNECTION and ELECTRIC QUANTITY. Grip helps to carry the board more easily when not in use, and it comes along with a auto sensor light. This board only weights 10KG, 50% weight each side to keep it auto balance before turn on and after turn off, making it much more stable. WARRANTY - One year limited warranty covers parts and labor from the manufacturer, a US company based in CA meaning quick response and service. KOOWHEEL IS ONE OF THE BIGGEST HOVERBOARD MANUFACTURER IN THE MARKET, you can visit our website for more information. [UNMATCHED PERFORMANCE]: Our Electric Smart Self Balancing Hoverboard takes you further and faster than any other hoverboard scooter on the market while ensuring you stay completely safe. This hoverboard can easily hit up to 9km/h max speed while making sure you stay in control for the most enjoyable riding experience. Bluetoo 4.2 Speaker & RGB LED :8.5 inches large wheels ,awesome RGB LED design with color lights and music, give you a colorful and freely experience. All Terrain Tires & High-standard Quality : Professional gyroscopes,acceleration sensors and motherboard ,give you a smooth and stable riding experience and help you to go wherever you want to go. 12 months warranty and 24/7 Service:one year warranty for wheel hub motor, controller and battery, half a year warranty for charger from the date of purchase.Any issue just don't hesitate to contact us.